All options come with smart phones. Smart phones make our work very easy and make us lazy. Turn on and off home appliances using smart phone with bluetooth is in market, but cost high. So DIY Blue tooth Home Automation using Free Android App and Low cost Link it one. 1) Check the function with Breadboard. 2) Implement in real time application. 1) Linik it one Board with WIFI Antenna. 5) Bluetooth Controller App Free Download from Google. 6) 12V and 5V Adaptor. 1) Connect the LED positive terminal to the Digital pin of Linkit one. 2) We can able to connect 9 Devices with this Program. 3) Connect from Digital pin 3 to 11. 4) Connect the WIFI/Blue Tooth Antenna to the Linkit one Board. 1) Connect Blue tooth module of the Linkit one board in server mode. 2) Check for incoming connection. 3) If Connected, then read the Bytes received, Change it to Char.4) We want to receive 0 to 8 (setup in Android app). 5) So Initialize a 9 element integer array. 6) Save the last status in the array. 7)On receive key Flip the Pin status. In program set the received byte length to 1. This makes very fast switching. 1) Download the Bluetooth controller from Google Play store. 2) Open the Application. Ask to turn on the blue tooth. 3) After Turn on the Blue tooth. 4) Application Loaded. In the Screen found 9 Empty Buttons. 5) In the Top Click Scan button. 6) Shows the Available Bluetooth device. 7) Select the Name Given in the Linkit one program. 8) The mobile connected to the device. 9) Click set keys in the right top of the screen. 10) Text boxes ask the button and and text to send while press the key. 11) Enter the name as u like and give 0 to 8 in data of key. 13) Now all done. Start checking. For testing see how the LED turn on and OFF. Its very quick because of send and read only one character. See the video. Then want to implement in practical purpose. 1) Disconnect the Breadboard and LED. 2) Connect the Relay module to the Linktit one. 3) I have 12 V 4 relay module. 4) I use a cable with connector to connect. So use the digital pin 10,11,12,13 to connect to the relay board. Connect the GND to the Relay module ground. 5) Link all the relay common using wire and join the wire to a power plug phase. 6) Connect a cell phone adapter to the Linkit one board and 12V adapter to relay module. 7) Take four long wires and connect it to the NO(normally open) of the Relays. 8) Plug the two adapter and the power plug for relay common to a extension board. 9) I stick the board using double side tape. Close the Box after connect the Bluetooth antenna. Now all ready its time to fix. Before fix a small change in program want to done because I only use Digital pins 10,11,12,13. 1) I use 4 Relay module here. So i can able to control 4 switches. 2) For easy circuit i use pin 10,11,12,13,GND. So change the program for that pin. 3) Program is attached with this project. As of now we test and work in low dc power and it don't make any major harm. Now we going to work in 230V AC power supply. Please work with any electrician. Even If u know about electrical, please switch off the main power supply while work with in power supply. 1 Dummy and 1 stair case light. 2) Before remove the screws switch off the main power supply and test the plug point with tester. 3) Remove the screws of the power plug. 4) In the bag side U found one side of the switches linked together, it is the incoming phase for the switch. 5) We want to give supply to the outgoing of the switch then only the devices ON/OFF with out switch control. 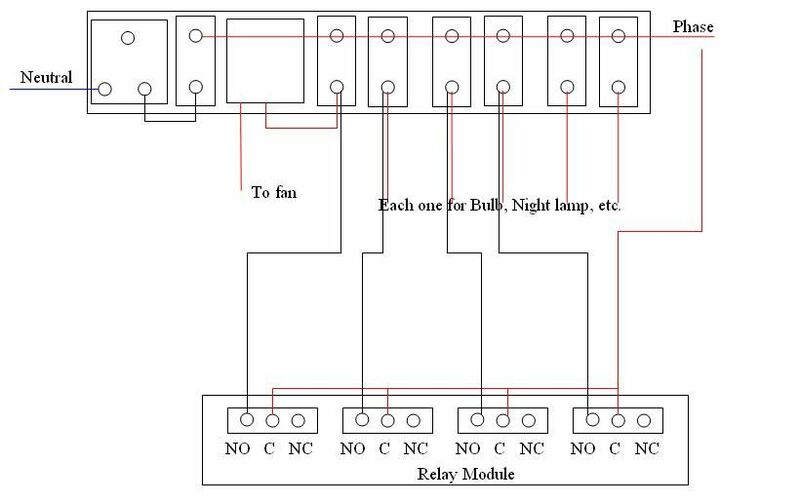 6) Connect the four wires from NO of the relay controller board to four switches outgoing side. If u don't want to control devices manual, then remove the wire in the switch and joint it with the NO wire from relay and don't forgot to insulate. 7) All work done now close the power board. Now Switch on the Main power supply. 8) Before connect the Extension board in the power jacket. Please conform the phase side in the power jacket using tester. Because for common of the relay we want to take phase only. 9) Switch on the extension board. 1) Now Turn on the mobile and open Bluetooth controller. 2) Use button 1,2,3,4 to switch ON/OFF the devices. 3) Change the button name according to the devices. Its very fun to work. But be safe when working with high power supply.